Check out the first ever Zhu Zhu Pets Movie! We know that loads of you love everything Zhu Zhu, so we’ve got some cool news. 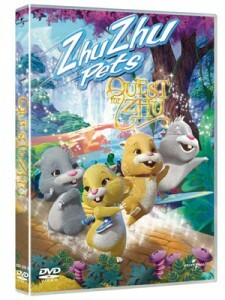 The toys are coming to life in a brand new feature length animated adventure called Zhu Zhu Pets: Quest for Zhu. Out on DVD and Blu-ray 3D on 17th October, you can watch your favourite characters as four colourful young teens (who happen to be hamsters!) go on a quest to find the Palace of Zhu, where they believe all their dreams will come true. In the film Pipsqueak is swept away to the other side of the Zhuniverse on a shooting star. Along the way she befriends Chunk, Num Nums and Mr Squiggles as they travel across the Amazhun Jungle and snow covered mountains, meeting all sorts of creatures from the wacky ApeHam to ferocious Zhurasics! However, when they reach the Palace of Zhu, their adventure has only just begun. A mean spirited reptilian creature called Mezhula has overthrown the palace and enslaved all the other hamsters, including the great wizard Zhu Fu. It’s up to Pipsqueak, Chunk, Num Nums and Mr Squiggles to save the day!